Netanyahu and EU foreign policy chief end a freeze on talks regarding the peace process, imposed by Israel following EU labeling decision. Prime Minister Binyamin Netanyahu and the EU foreign policy chief Federica Mogherini spoke on Friday and ended a freeze on talks with between Israel and the bloc on the Israeli-Palestinian conflict, AFP reports. Foreign Ministry spokesman Emmanuel Nahshon told journalists that Mogherini said during the conversation with Netanyahu that the European Union's November decision to label goods imported from Jewish communities in Judea and Samaria "does not prejudge the outcome" of the conflict. "The conversation resolved the tensions and we are, Israel and the EU, back to good and close relations," Nahshon wrote in an English-language comment on social media quoted by AFP. On November 11, the EU passed a decision to label products from Judea, Samaria and the Golan Heights as “settlement products”. Following that decision Netanyahu, who is also foreign minister, ordered the freeze in discussions with EU on the peace process. 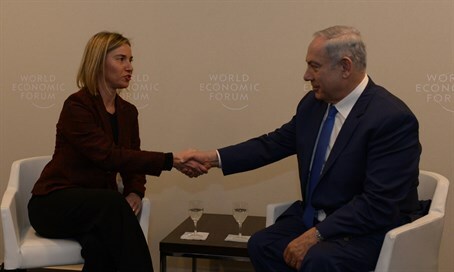 But Nahshon wrote on Friday that Netanyahu and Mogherini "agreed that relations between the two sides should be conducted in an atmosphere of confidence and mutual respect...that will assist in advancing the Middle East peace process." Netanyahu flies to Berlin on Tuesday at the head of a ministerial delegation for talks with German Chancellor Angela Merkel and members of her cabinet. The announcement of the restoration of ties between the sides followed reports earlier in the week that Israel and the EU were holding “quiet talks” in the hope of resolving the crisis. According to Haaretz, the EU’s deputy Secretary General for the External Action Service, Helga Schmid, came to Israel with her team on a secret visit last week to discuss a solution to the problem. Schmid, who is a senior adviser to Mogherini, reportedly met with Foreign Ministry Director General Dore Gold, representatives of the National Security Council and officials from other ministries. The last round of American-backed peace talks between the Palestinians and Israel collapsed in April 2014 after nine months of fruitless meetings amid bitter recriminations. After meeting in Munich on Friday with fellow members of the international Middle East peacemaking Quartet, Mogherini said the group planned to draft "a report on the situation on the ground". "We want it to be not only a report on the state of play, but with recommendations," for progress toward establishing an independent Palestinian state alongside Israel, she told journalists, according to AFP.